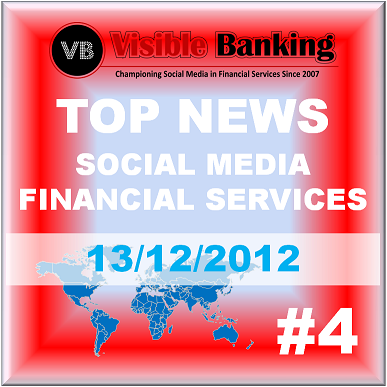 6 Top Daily News on Social Media in Financial Services (13 December 2012): Monitize partners Mint to offer PFM integration in mobile banking apps, bitcoin debit cards coming soon, La Caixa taps SoLoMo with online community. This is our selection for Thursday 13th December 2012. Please flag any missing major news and share your comments here on our blog, or via twitter (@Visible_Banking). La Caixa launched the first online community named premiaT that aims to help generate customer loyalty and drive direct sales from an international financial entity. The bank also offers applications that feature a wide range of customer services. Paymium, a small French company based in Paris, has plans of making Bitcoin handling easier by issuing debit cards early next year. These debit cards will be linked to payment accounts that will accept the alternative currency. This technical innovation has the potential to introduce competition to traditional banking systems that lack innovation. Majority of the CEOs of the top 100 companies in Australia do not take advantage of social media due to fear of harming their own reputations and the companies they represent. They fail to tap to Twitter, therefore closing themselves from one of the most powerful communication tools in the world, which can one day become a dominant source of information. Intuit Monitise offers banks the chance to integrate Intuit’s leading personal wealth management solution, Mint, into their mobile banking offerings. With Mint as a part of the bank’s mobile banking app, it could greatly help in the budding digit wallet competition of banks. Monitise are also looking to enhance their mobile commerce and mobile payment promotions. The Central Bank of Nigeria (CBN) launched its strategy to take over Nigerians who make business transactions outside the banking system in order to further enhance financial stability. Survey revealed that 39.7% of Nigerians are financially excluded. The bank aims to reduce the financial exclusion rate with 7 key interventions. Sanjeev Kapur of Citibank India talks about the success of the ‘Dil vs Bill campaign and the reason behind the steady increase of Citibank’s brand value through social media. DNA Money conducted an interview leading answers to questions about social media banking and its effect on consumer value.